Day 3 and it was leg day at the gym. It’s a difficult day to describe because there are pros and cons so that’s why I chose “Love/Hate Relationship” as my title. Leg day is super encouraging to me because that’s the day I get to lift the heaviest weight! My legs are so much stronger than my upper body so I feel even more accomplished with each set I complete. 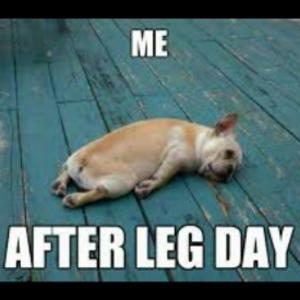 Leg day is also rough because it continues to affect you after you leave the gym… and usually the next day as well! The lifts we did today were leg press, calf raises, and hamstring curls. We paired the lifting with crunches which we followed up with a new cardio exercise….. stadiums! Yeah, choosing to run up bleachers after leg day may not have been our best idea! Our goal was to run up and walk down the bleachers 10 times, but after 7 we decided that we had reached our limit. It was disappointing for me to not reach our goal, but 7 is way better than zero! That’s it for today because I’m about to join a training session for new It Works distributors!